If you can think of an animal, there is a very good chance that it will be a mammal. People are mammals. Cats and dogs are mammals. So are farm animals such as cows, goats, pigs, and horses. Mammals also include other unusual and fascinating animals such as porcupines, gorillas, giraffes, rhinoceroses and kangaroos. Mammals are found all over the world in all sorts of different environments and climates. Mammals such as chimpanzees and elephants live in tropical regions. Arctic foxes and polar bears make their home near the North Pole. Camels and coyotes live in deserts. Some mammals, such as dolphins, seals and whales, live in the sea. One group of mammals, bats, can fly. All mammals (apart from the duck-billed platypus) give birth to live babies, which are then fed on their mother’s milk. Most mammals give their young more protection and training than other animals do. Mammals have hair or fur. All mammals have hair or fur at some time in their life, though in certain mammals, such as whales, it is present only before birth. Mammals are warm-blooded. Their body temperature remains about the same all the time, even though the temperature of their surroundings may change. Mammals have a larger, more developed brain than other animals. Some mammals, such as chimpanzees, dolphins, and especially human beings, are highly intelligent. Nearly all mammals are able to move around using limbs and are known as tetrapods (which means four limbs). Whales and dolphins would have had limbs but over time, have lost them in the process of evolution. There are between 4,500 and 5,500 species of mammals. The largest mammal is the blue whale (weighing 160,000kg) and the smallest is the bumblebee bat (weighing 2g). Mammals that eat meat are called carnivores. Mammals that eat only plants are called herbivores. Mammals that eat both meat and plants are called omnivores. Mammals have several different kinds of teeth, which allows for more efficient processing of food. Mammals evolved alongside the dinosaurs. The most abundant mammals were small, nocturnal and fed mostly on insects to survive. Once the dinosaurs became extinct, the mammals began to thrive. There are more rats and mice than any other kind of mammal on the planet…. even humans! The loudest mammal on Earth is the Blue Whale. Its call can be as loud as 188 decibels, which is as loud as a bomb going off! 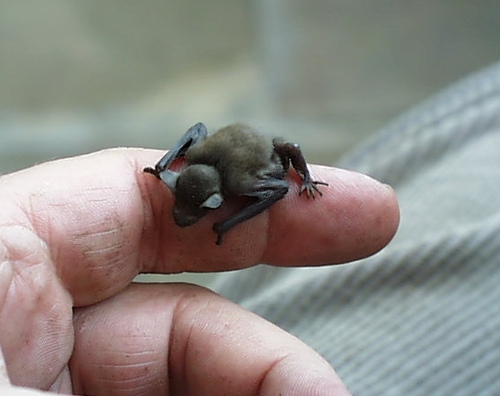 Bats are the only mammals that are capable of flying. Lots of people think that birds are mammals but, although they are warm-blooded, they belong to a group called ‘aves’. The mammal with the longest gestation period (being pregnant with a baby) of 22 months is the elephant. The Virginian opossum has one of the shortest gestation periods of just 12 days. Some mammals, such as the anteater and the Baleen whales, do not have any teeth. Shrews have so little body fat they cannot go more than a couple of hours without food. Missing a meal is a sure way to a quick death. A good night's sleep could be fatal! A polar bear looks white, but he isn't really. His long, shaggy hairs are colourless and hollow. Beneath his hair, the skin is black. Mammals are grouped by some basic characteristics that all of them share. Mammals are endotherms, which means that their bodies can generate heat in order to maintain a suitable body temperature. They have special glands called mammary glands which produce milk for feeding their young after they are born. Hair is another important feature in mammals and it is present on their body at least at some point in their life. They also have three bones in their middle ear. Their circulatory system (how blood is sent around the body) is highly efficient and a four-chambered heart is one of the exceptional features of mammals. All mammals breathe air, even the ones which live in the ocean. Their lungs play an important role in the exchange of oxygen and carbon dioxide. Though most mammals all share certain features or characteristics, some of them do stand out from the crowd. All mammals have four legs except whales, dolphins, dugongs and manatees which lost their hind limbs in the process of evolution. Mammals usually have seven neck vertebrae (the bones in the spine), though the three-toed sloth has 8-9 neck vertebrae. Teeth are replaced once in the life cycle of a mammal and not continuously. The exceptions to this rule are pygmy rock-wallaby, silvery mole-rats and manatees, whose teeth are continuously replaced during their lifetime. Prototheria – These mammals lay eggs, incubate them for a certain period, after which the young ones are born. The platypus, and the echidna are the only prototheria on Earth. Metatheria – Includes mammals which have abdominal pouches. These are also known as marsupials. They give birth to underdeveloped babies which are then carried in the pouches till they are fully developed. Kangaroos and koalas are some well-known examples of marsupials. Eutheria – These mammals do not have pouches and the baby is kept nourished within the body until it is ready to be born. They are also known as placentals. About 95% of mammals belong to this group. Human beings, elephants, tigers, cows and bears are some examples of placentals. Eutheria – mammals which do not have pouches. The baby is kept nourished within the mother's body until it is ready to be born. Herbivore – animal that feeds only or mainly on grass and other plants. Can you spot any mammals on this virtual tour of London Zoo? You are never far away from a zoo or wildlife centre. Here is a list of every zoo in the UK! Look at pictures of some unusual mammals, both living and extinct!